Pensacola Bahia grass leaves are long and slim. The species has an extensive root system that can reach 7 to 10 feet deep into the ground. Pensacola Bahia is commonly grown in pastures and along roads in the southeastern United States. It grows well in colder soil temperatures, which makes it ideal for the cooler sections farther north in southern states. If planted in colder regions, Pensacola grass will make more growth in the early and late season than other types of grass. Plant Pensacola Bahia grass seed one month before you hope to see sprouts. It takes the variety an average of 28 days to germinate. If you're planting in July or August, when it is hot outside, germination can happen much faster--in 10 to 14 days. Get rid of anything that gets in the way of that such as weeds and stones. Break up dirt clumps that are larger than 1 inch in diameter. Smaller ones can remain. If there are too many weeds to pull out, use a weed killer on them. Spray the herbicide a few weeks before planting so it does not interfere with the Pensacola grass seed. 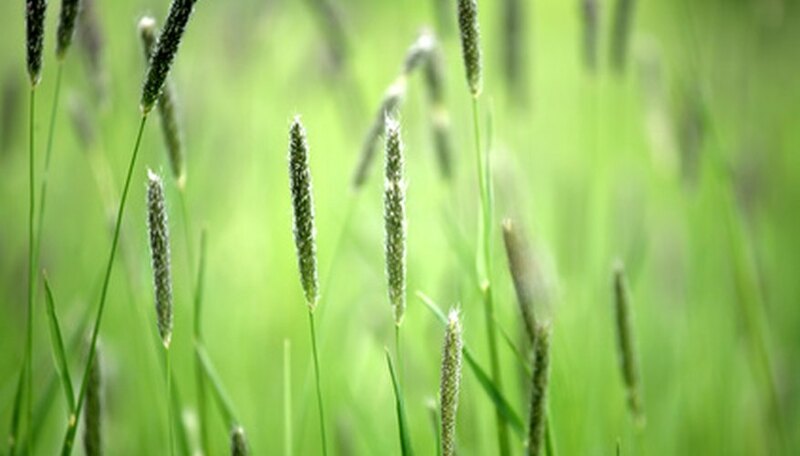 Grass seed needs to touch soil to germinate successfully, so you need to smooth the soil. Run a rototiller over the area to loosen the top 4 to 6 inches of soil. Shovel top soil into the dips and rake it out to level the area. Spread 1 inch each of compost and sand on top of the yard. Till it into the top 1 inch of earth. Fill a broadcast spreader with a starter seed fertilizer or fertilizer that is high in phosphorus. Disperse it over the area, following the package directions. Use a push or hand spreader to apply the Pensacola Bahia grass seed. Disperse about 10 lbs. per 1,000 square feet. Spread the seed in one direction, then work perpendicular, to ensure that you have even coverage. Run the back of the metal rake gently over the grass seed. Cover it with 1/4 to 1/2 inch of the amended soil. This will keep it in place and speed up the germination process. Press down with your feet to push the Pensacola Bahia grass into the ground. Water Pensacola Bahia grass seed every evening until the seedbed is moist. Don't saturate the soil. After 10 days, the grass should start to sprout. Cut back on watering to one daily session of 15 to 30 minutes. Do not buy Pensacola Bahia grass seed from any seed dealer. It is sold as non-certified seed, so buy it from a reputable dealer.